Most people who have visited my booth recognize this rock I call my "Disco Ball". It's been around for a long time, and took a long time to paint.Painting on this rock was difficult because of all the various colors and small dots I laid down in a spiral pattern.The paint I use is very viscous and is almost like painting with Elmer's glue.The rock itself is quite large and could probably be used for lawn bowling or even as a shot-put! I like it because it has become a friendly display rock that can be found on the corner of the display table at every market. Thank you for visiting the "Your Spirit Rocks!" blog spot. "Your Spirit Rocks! "came to me as a result of the enthusiasm I want to share with you.This is how it began. 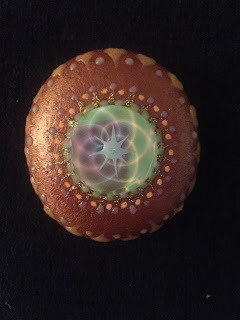 Let me start with a disclaimer...Although I like to refer to these as "Spirit Rocks",they are spiritual only in the sense they contain a connection to the spirit of the earth for which they are imbued. That being said,This site is not connected with the renowned Spirit Rock Retreat Center in Fairfax,CA. I honor and respect the contribution they have made,and the good work that they do. This story began in October,2009 when I headed west to the coast to follow the dictates of my heart. I had left a wonderful job,working eight years as a Concierge in a prestigious cooking school. Here,at sixty, and looking for guidance from a Higher Power,I did not know where or what to do next in my life.What I found pretty much answered those questions for me. Russian Gulch is an area just north of Jenner, CA...I parked my old Ford in a small,not-so-obvious turnout off the coast road and began to hike towards the ocean where the waves crashed off in the distance. After walking a quarter of a mile,you reach a clearing where a small stream blocks your entrance to the beach. When the tide comes in, People will throw logs and branches to make a bridge to cross to the beach, but it's probably just as easy to roll your pants up and take your shoes off to wade closer to the shoreline.During the summer, these measures are not necessary, but the surf crashes hard on this private little beach.It is enclosed on the north and south sides and is only a hundred yards,in length.The undertow can be very strong. Late in the afternoon, a few rocks were kept in my pocket as I headed back to the car.The ride home was exhilarating.My mind entertained pleasant memories of summers past.Warm days and balmy evenings playing on the beach,swimming in the Russian River, and going to teen club dances in the evening are the stuff of youthful dreams. At home, I emptied my pockets and began to paint them using acrylics.Once dried,I took other colors and started to decorate several rocks. The paint adhered nicely to the surface,and a small amount of glitter embellished them even more. Lastly,some glow in the dark paint was applied.It all worked beautifully. Turning off the lights,it seems a spirit emanated as a flashlight was held to the glow paint.Gradually, the initial glow faded,but easily recharged depending on how long it was held under a light.Finally, a clear coat of varnish was applied to protect each component,so as to render a lasting product when dry.What a thing to behold! These rocks have been given away to friends and family. They have been sold as personal gifts, and are kept or passed on. They contain only the good fortune and power you allow them. Perhaps far in the future someone will venture off to Russian Gulch where they too will acquire the same or a similar experience... just by holding a simple rock! 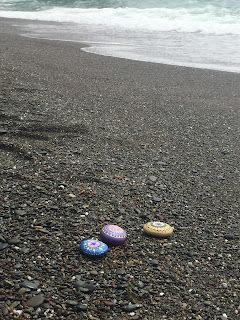 These rocks provide a lot of joy as they get passed along.Now I have focus and direction about what I want, and where I am going.I thank my Higher Power each day for what has been given me... what has been taken from me, and what has been left. 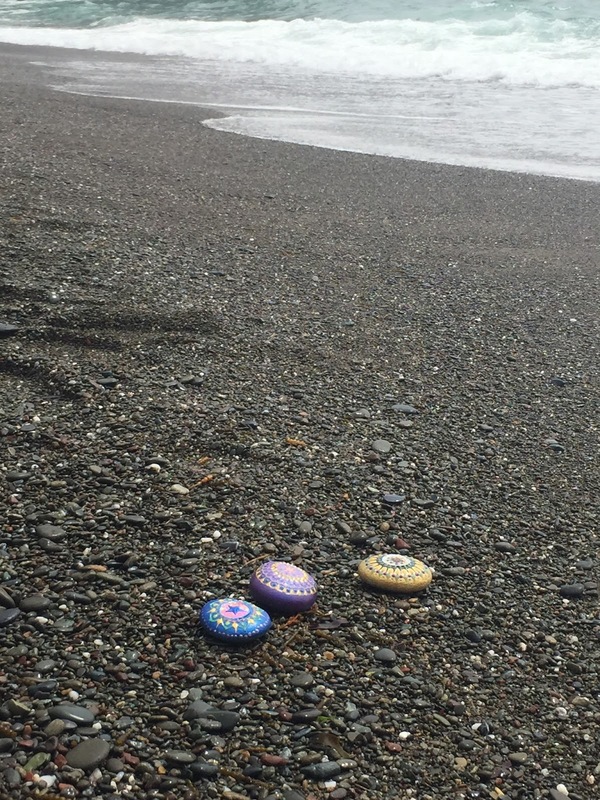 It had to happen.This great idea also occurred to me a few years ago.Now Naparocks has done something about it.Painting and hiding rocks for people to find and post on Facebook.I know that you can still find Your Spirit Rocks™ at Bothe State park, Lake Hennessy and out on the coast near Jenner... and they will be yours to keep.However,It pleases me to hear that a Facebook group has formed in Napa with over 1500 members and growing fast. People are painting and planting them in public places to be discovered by those lucky enough to find them. So, if you have painted a rock and are about to hide it,make sure you have "Find on Facebook at Napa Rocks" on the back.Then,as the instructions say...Post a picture and a hint to where it can be found (park, school, etc.) Lastly,Hide the rock for others to find. Below is my first entry in this Naparocks Game.Hint: It's somewhere between the Sharpsteen Museum and the Calistoga Police Dept. (Drop by on Saturday morning at the Farmer's Market, and I'll take your picture if you spot it) Happy Hunting! Okay,so I've decided to post this as "The Rock of the Month" only because I have been unable to keep up with this blog. It has been a long busy summer, and just keeping the inventory stocked has been challenging.The popularity of these items has surprised me from the beginning, and it sparks my curiosity to see which rocks move.Especially those which one may consider to be "abstract". Figurative pieces like a dragonfly or a cat may be popular only in the sense that people would identify with them.Initially however, these rocks were meant for meditation.As such, concentric designs have been the most prolific.Size,texture,weight,color,glow,shine and "Feel" have been the characteristics that people consider when choosing a rock.When I say "Feel" people may look at me funny, but in a sense, every rock is individualized,even without adorning it with a specific color or texture. Most of the rocks are smooth and flat enough to paint on.The rocks are for the most part,symmetrical to add uniformity to each piece.The rock featured below has a hologram in the center to add dimensionality to it.